Controlling St. Augustine weed grasses is best done by prevention. Healthy, well-maintained St. Augustine grass is not prone to weed problems. 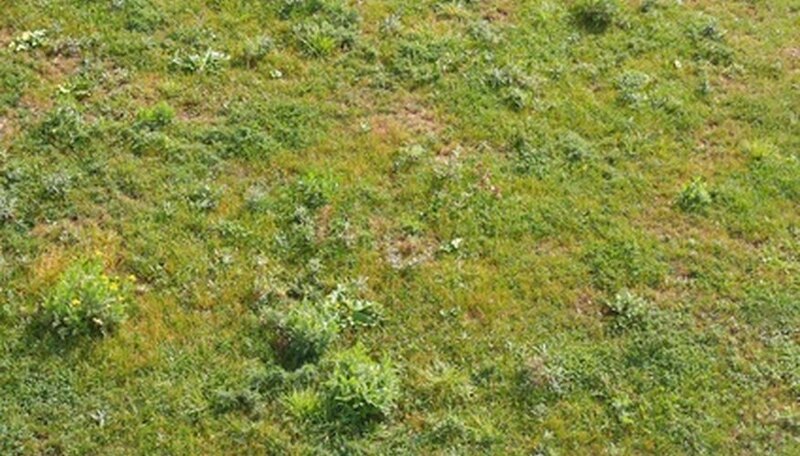 When grass weeds strike a lawn, identifying the type of grass weed is essential to eradicating it. Types of grass weeds include annuals and perennials and require differing treatment measures. Crabgrass is an annual grass. Known to invade many types of lawns, including St. Augustine grass, crabgrass shows up in the warm summer months. Left to grow, crabgrass reaches a height of 3 to 5 inches and produces flower stalks that stick out of the grass, have four to five branches coming out of them and look somewhat like tiny antennae. When crabgrass appears, it usually means you aren't mowing your lawn to the proper height. Mow St. Augustine to a height of 1 to 2 inches in the spring and 2 to 3 inches in the summer. Crabgrass does not germinate at cool temperatures, and tall grass helps keep the soil cooler in the warm months. Clean your mower after each mowing to get rid of any seeds that could spread the weed grass. Severe infestations of crabgrass can be treated by pre-emergence or selective post-emergence herbicides, but meticulous seed control can help get rid of crabgrass within one growing season without damaging the desired grass. Annual bluegrass grows in clusters of dark green grass. The flower shoots grow to about 4 inches tall and look somewhat like sparse stalks of wheat. Annual bluegrass sometimes is referred to as "Poa" because its scientific name is Poa annua. Annual bluegrass is best controlled by making sure mowers are cleaned between mowings, especially if they are used on several different lawns. Ensuring that no new annual bluegrass seed gets on your St. Augustine grass is the best way to keep annual bluegrass from returning. Herbicides kill annual Bluegrasses, but they also kill surrounding grass and must be applied with great care. Bermuda grass is a drought-tolerant perennial that invades St. Augustine lawns in most of the United States. Bermuda grass stays short, grows low to the ground and shoots up flower spikes that look like tiny birds' feet and legs. Because it is better adapted to the areas in which St. Augustine grows, Bermuda grass can be difficult to fight. Apply direct sprays of grass-killing herbicide to invading Bermuda grass diligently before it gets out of hand and takes over the lawn. Dallis is a tufty growing grass that starts in a clump and expands outward. At up to a 1/2 inch in width, the leaves of dallis grass are much wider than the leaves of other types of turfgrass. Dallis grass thrives at high altitudes. The best way to get rid of Dallis grass is to dig out clumps and cover the holes with a good mulch layer. Dallis clumps that cannot reasonably be dug out can be fought with consistent direct application of grass herbicide, applied with care to avoid damaging the desired lawn grass.